Deviled eggs are a party favorite. They are one of the most popular finger foods you can whip up. When you are preparing for an event or party you always want to make foods that are easy to grab and not extremely messy. Deviled eggs fit the bill perfectly. If you want to add a little twist to the traditional deviled egg, then you can try this cheese and bacon version. 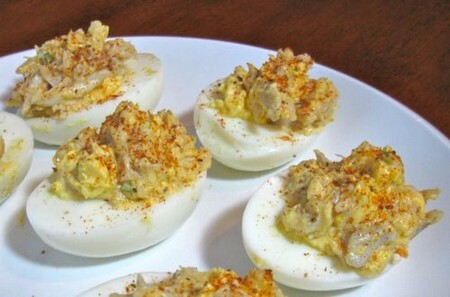 These delicious deviled eggs kick up the flavor a bit and are sure to become a crowd favorite. Here is how you can make your own delicious cheesy, bacon deviled eggs. They are quick, easy and tasty. Start by boiling 8 eggs. Place the eggs in a pot or saucepan. Cover the eggs with cold water. Make sure the water is 1 inch or more above the surface of the eggs. Turn your stove top too high. Allow the eggs to come to a full boil. Then, turn the heat setting to medium high. Allow the eggs to cook for 10 more minutes. Remove the pan with the boiling eggs from the stove top. Drain the eggs in the sink. Be careful of the steam. Cool the eggs by filling the eggs with cold water. Drain the eggs of the cold water. Crack each egg on something hard. Remove the outer shell. Discard the shells. Rinse the eggs again under cold water. Dry the eggs with a paper towel by patting them. Use a sharp knife to cut each egg in half. The eggs should be sliced lengthwise. Carefully remove the yolks with a wet spoon. The water from the spoon stops the yokes from sticking and makes for easy removal. Halve the eggs lengthwise with a sharp knife. Place the yolks in a bowl on the side. Crumble some cooked beef or turkey bacon into a bowl. Add the cheese spray, mayonnaise, onion, salt and pepper. Whip all these ingredients together with a fork. 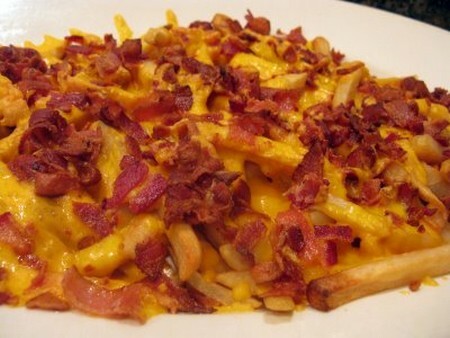 Now take teaspoons of your bacon and cheese mixture and place them inside the empty egg whites. To add more color you can garnish the tops of your cheesy bacon deviled eggs with a sprig of dried parsley and paprika. Place your cheesy bacon deviled eggs on a pretty platter to serve. If you are not going to serve them right away, cover them with plastic seran wrap and place them in the refrigerator to cool.